On 21 March 2019, the Belt and Road Forum for Broadcasting Science and Technology Development was held in Beijing. 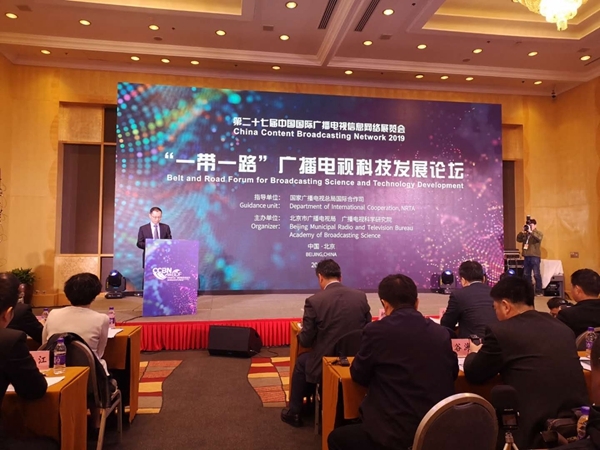 The forum was advised by International Cooperation Department of National Radio and Television Administration (NRTA), and co-hosted by Academy of Broadcasting Science of NRTA and Beijing Municipal Radio and Television Bureau. Around 200 representatives from competent authorities, diplomatic missions, broadcasting organizations at home and abroad, technology enterprises and media attended the forum, including media officials, media and business representatives from Cambodia, Lao PDR and Indonesia. Mr. Wang Zhiquan, Deputy Director of Information and Public Relations Division of ASEAN-China Centre (ACC), attended the event upon invitation. As an important part of China International Broadcasting Development Forum, the forum focused on broadcasting technology and industry development of the countries along the Belt and Road, shared China’s experience of technology innovation in advancing the Belt and Road Initiative, and aimed to promote exchanges and cooperation between China and relevant countries.